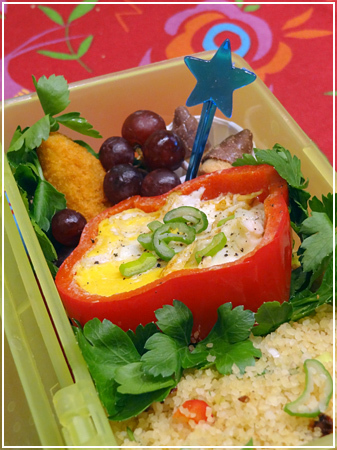 I saw these the other day and just had to try making them for bento :) Sadly mine didn’t get as perfect – I shall have to work on my technique for not letting half the egg run out under the pepper, and I couldn’t let the yolk stay runny as it has to keep until tomorrow – but they certainly will be tasty! 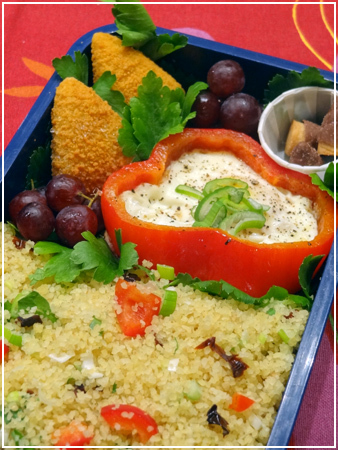 Bulgur with spring onions, parsley, sundried tomatoes and bell pepper pieces, bell pepper ring with a fried egg inside and spring onion decoration, Brie poppers, grapes and “bamboo shoots” candy. More parsley as decoration.